Carry all your essential baby items with our nifty Casey Diaper Bag! Made to look shriek and modern, our diaper bag offers great utility with spacious compartments and pockets for almost every situation. 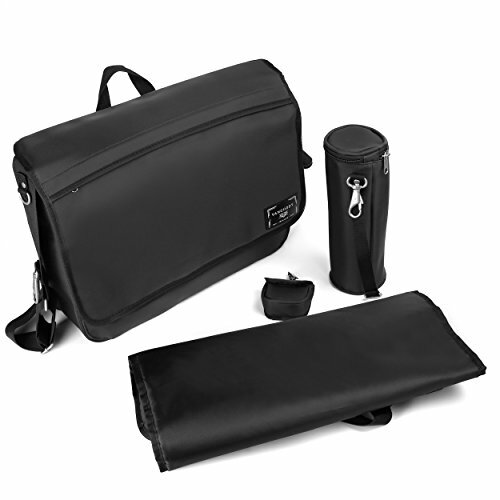 Included in this package are: one 17 inch by 13 inch weather resistant shoulder bag (built with multiple zippered pockets) an insulated bottle carrier (great for keeping drinks cold or warm) and changing pad (ideal for avoiding dirty surfaces). The Casey is a great additional for any and every trip! When it comes to carrying all your baby's favorite items, Casy has you covered! Our bag may also make for a wonderful gift to new parents!